My biggest boy turned two last weekend, and we threw quite the shin dig for out little guy. 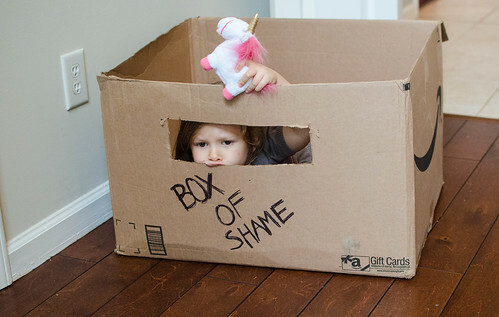 As a middle child myself, I have plenty of mom-guilt about Smith getting the short end of the stick, so I really wanted to make his party special. This was amplified when as we were planning the party, Joey asked "Wait, he's not two yet?!" We laughed about it, but there is some truth to the sentiment - so much has happened in the past few years, that it seems crazy that he's only two years old! A new house, new car, and two baby brothers - this kid has already had plenty of excitement in his short life! 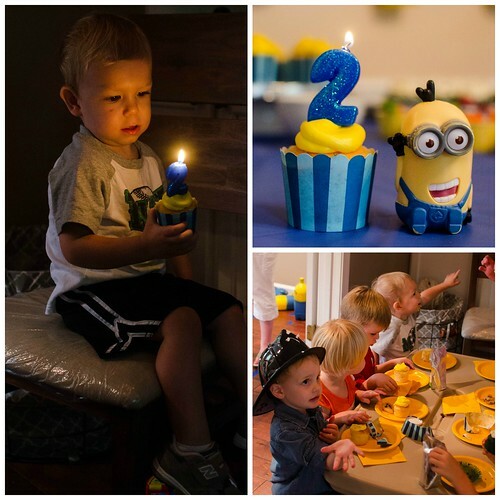 Smith is absolutely obsessed with the movie Despicable Me, so it was a pretty easy decision to assemble his minion friends and throw him a despicable birthday party! Joey and I actually really love the movie as well - it is funny, packed with action, and heartwarming (I dare you not to cry at the end). He watches (part of) the movie almost every. single. 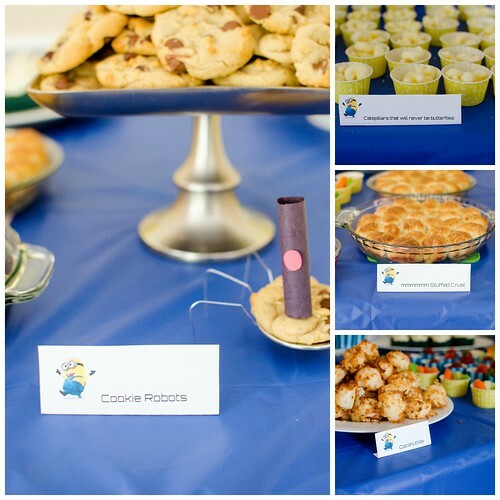 day, so we had tons and tons of ideas of ways to incorporate the movie into the party - from snacks, to games, to decorations - I had a huge list of ideas, and pared it down into a more manageable and reasonable party for a two year old. 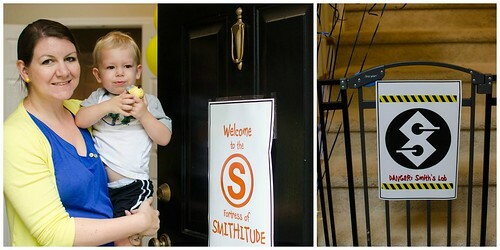 Just as Vector welcomes visitors to the "Fortress of Vectortude," we welcomed guests into the "Fortress of Smithitude." We also warned party-goers from going upstairs into "Smith's Lab." Joey made these signs in Microsoft Word, and we had them printed at Staples. 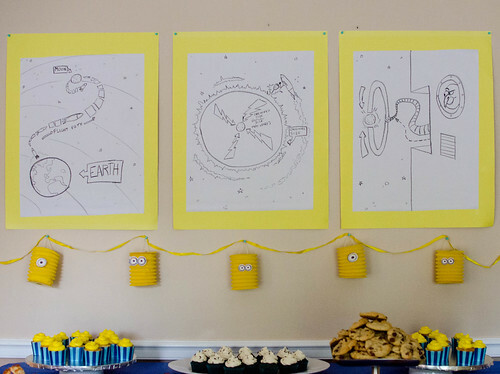 For the food table set-up, Joey put his artistic ability to the test, and drew renderings of Gru's plan to steal the moon. I also bought some paper lanterns from Party City, and taped on some minion goggles. 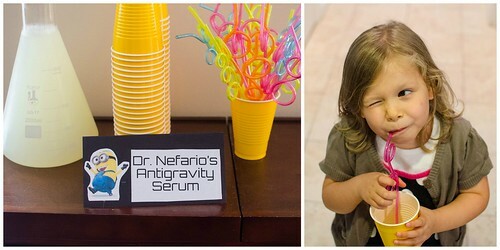 I served "Antigravity Serum," aka lemonade, out of a big Erlenmeyer flask, and the kids got to drink it out of Vector's Crazy Straws. Caroline was flummoxed as to why she wasn't floating (she also dressed as Margo for the party). Perhaps my favorite detail of the party however, was this sign. This scene from the movie has become a source of constant entertainment in our house, with one of us just randomly saying "I sit on the toilet," and all of us dissolving into laughter. If I had to choose, I would say this is my favorite scene of the movie. Once again, Joey was responsible for this decoration. 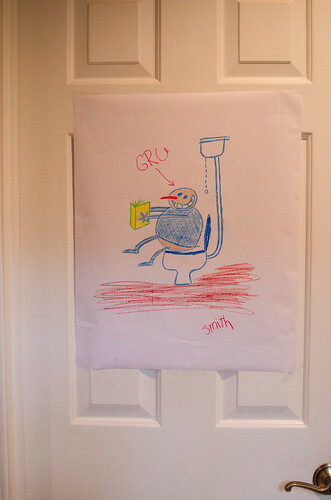 We actually hung this on the bathroom door, which really upset Caroline - she wanted it in the dining room with the rest of the plans. For the games and entertainment, we kept in mind that all the kids attending were five and under, so nothing too crazy or complicated (though Caroline did want us to build a "big and fast roller coaster" in the backyard. 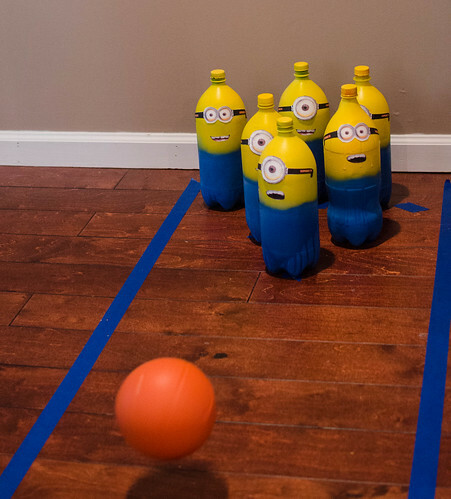 We also spray-painted two liter bottles to look like minions, and glued on goggles and mouths. We had originally planned for the games to be outdoors, but it rained all day long. 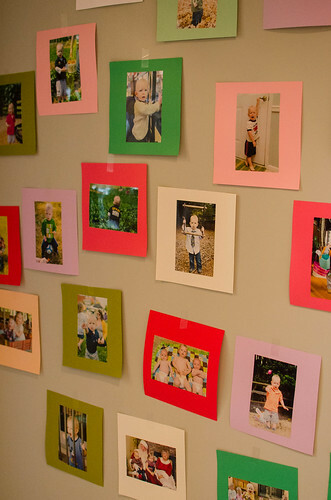 So we improvised, and set this up in the playroom. We also set up a version of the angry spaceship game, that Gru so infamously "Knocked Ov-ver!" 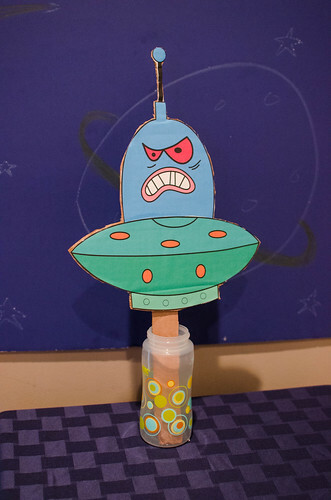 I got the idea and printable from here, and we used a Nerf dart gun to shoot the space ship. The kids all really loved shooting the dart gun, and Joey had fun "manning" this game and helping the kids aim. After some snacks and games, it was cupcake time! 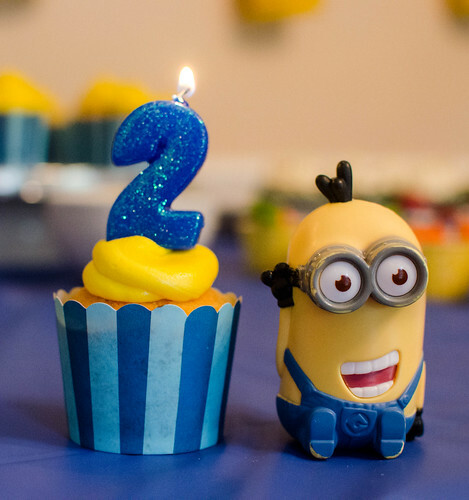 I've seen lots of cute minion cupcakes made out of Twinkies, but to be honest, I didn't have that kind of time, and I didn't want to be TOO over the top! So I just used some cute blue wrappers and yellow frosting to make the cupcakes "minion inspired." This was my favorite moment of the party. Smith was playing and having fun, and of course got really excited when it was time to sing Happy Birthday. However, he must not have realized that the party was for him, because when we sang "Happy Birthday, Dear Smith," his face absolutely lit up, and he was grinning from ear to ear. Such a sweet boy. As we were setting up the party, Joey and I joked that we were going to have more fun than Smith, but I don't think that happened. 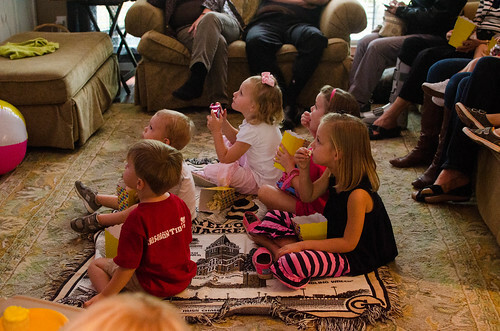 He absolutely loved the party, all the minions, and all his friends. Smith is such a sweet and special little boy. He is a loving and doting big brother to Henry and Tucker, he adores his big sister "Care-hine," and has such a sweet spirit and fun personality. Happy Birthday, buddy! If you've spent any time at all on Pinterest in the last three months, you have no doubt seen Martha Stewart's One-Pot Wonder Pasta. I'm pretty sure that every single one of my friends has pinned this recipe. And for good reason - I made it about a month ago, and it was a huge hit with my whole family. It was also one of the easiest dinners I've ever made, which is an added bonus. I loved it so much in fact, that I began envisioning countless variations and iterations of the dish. I started with this creamy lemon version. 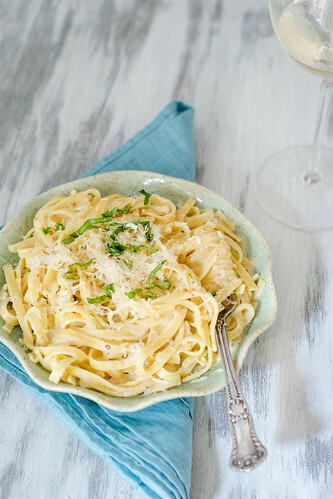 It is alfredo-esque, but lighter, and honestly, more flavorful. This creamy white wine and lemon sauce hits on all the major notes - creamy, salty, tart, and just a little spicy. I had originally planned to add shrimp and mushrooms to the final dish, but decided to keep it simple this time. I just served it with some roasted broccoli on the side, and it was such an easy and delicious meal. 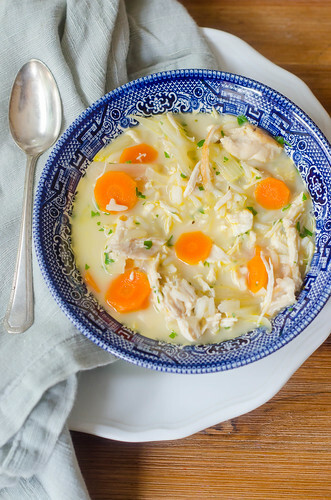 I don't have much more to say about this one - it's so easy and tasty that I think it speaks for itself. 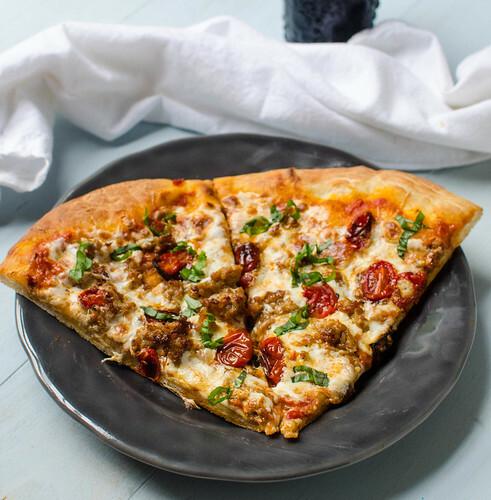 Start off the week with some comfort food! In a large straight-sided skillet, combine the pasta, onion, garlic, red pepper flakes, basil, olive oil, salt, black pepper, water, milk, wine, and lemon zest. Bring to a boil over medium-high heat, using tongs to turn and stir the pasta often. Boil until the noodles are al dente and most of the liquid has evaporated/been absorbed, 8-12 minutes. 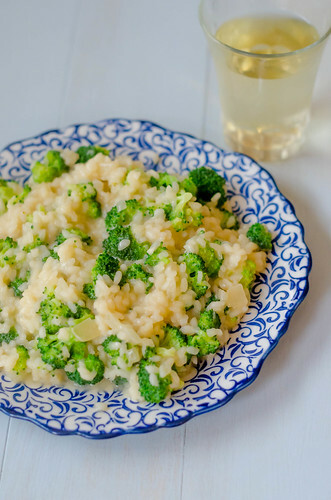 Remove from heat, remove the sprigs of basil, and stir in the cream, parmesan cheese, and lemon juice. Allow to sit for 5 minutes, stir again, and divide among bowls. Serve with additional Parmesan cheese and basil, if desired. I've gotten out of the habit of meal-planning lately, and it's definitely been a stressor for me. If I don't have a dinner planned out, I feel like I spend the majority of the day staring blankly into my fridge, pantry, and freezer, basically just willing something to magically appear or give me inspiration. Or going through my Pinterest boards and saved recipes hoping that I miraculously have all the ingredients I need for a particular recipe that catches my eye. I try to minimize my trips to the grocery store throughout the week, both for budgetary and logistical reasons (Three kids under 2. No further explanation necessary). On this particular day, I remembered that I had some shredded chicken and some extra enchilada sauce in the freezer - score! Earlier that day I laid down the gauntlet for myself and decided we were having quinoa in some fashion, and cooked a few cups during nap time. 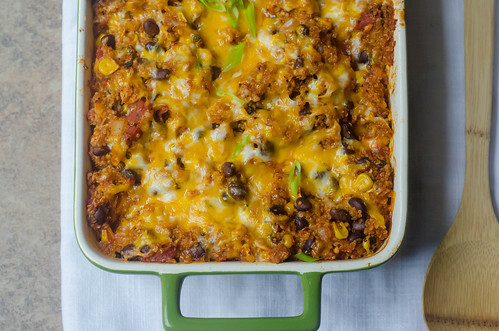 I'm pretty much always craving Mexican food; thus divine inspiration hit, and this casserole was born. Chicken Enchiladas are one of my favorite foods of all times, so it should come as no surprise that I like to reincarnate them into as many different dishes as I can. So far, pizza, dip, pasta, and zucchini boats have all been pretty well-received at our house. So a cheesy, baked casserole seemed like a surefire win. And obviously, it was. I've gotten into the habit of using quinoa instead of rice 90% of the time, so I continued on with that trend here. It adds a lot of protein to the dish, so combined with the chicken and black beans, this dinner packs a major protein punch. I also mixed in some corn, enchilada sauce, a modest amount of cheese, and a few extra spices and seasonings before baking it in the oven. As expected, we all loved this dish - and what's not to love? 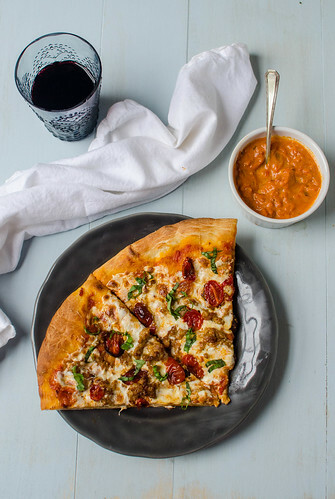 It's comforting, cheesy, spicy, reasonably healthy, and reminiscent of my all-time favorite meal! I already had chicken, enchilada sauce, and quinoa prepped, so this came together quite quickly. Even if you are making everything at once, it can all be done pretty easily as well - as the chicken cooks, make the enchilada sauce and cook the quinoa, then it's just assemble and bake. As a matter of fact, this would make a great make-ahead meal, so you could prep and assemble the night before or morning of, then just throw it in the oven when you get home. Preheat the oven to 350 degrees. Lightly grease a medium baking dish. Combine the quinoa and water in a medium saucepan and bring to a boil. Cover, reduce heat, and simmer until most of the water is absorbed and the quinoa is cooked through, about 15 minutes. Remove from heat and set aside. In a medium saute pan, heat the oil over medium heat. Add the onion and jalapeño, and sauté until softened, about 5-6 minutes. Remove from heat and set aside. 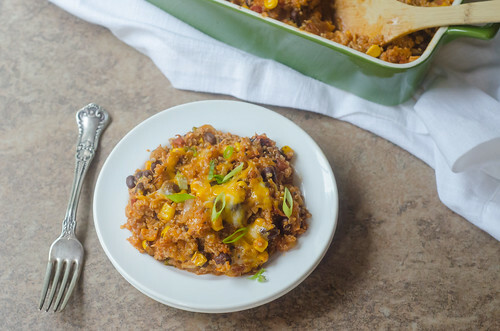 In a large mixing bowl, combine the quinoa, black beans, corn, tomatoes, chicken, cumin, chile powder, salt, enchilada sauce, and 1/ 3 cup of each cheese. Season with additional sat and pepper to taste. Mix well and pour into the prepared baking dish. Sprinkle with the remaining cheese, and cover the dish with aluminum foil. Bake 15-20 minutes, then remove foil. Bake an additional 10-15 minutes, or until the cheese is melted and browning. Rremove from the oven and allow to cool 10 minutes. Sprinkle with chopped scallions and cilantro, and serve. Note: This will make more than you need for this recipe, so I'd suggest just freezing the leftovers. You never know when you'll have an enchilada sauce emergency! 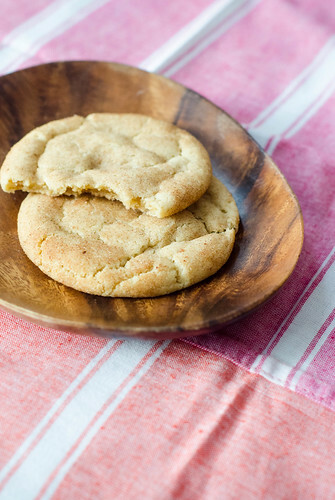 I know that brown butter has been all the rage for the past few years, and it's probably pretty played out at this point. But I'd like to think that it's all the rage because it's just so gosh darn tasty! Add brown butter to pretty much anything and it's an instant winner in my book. Which is why I wanted to smack myself in the head when I happened across a recipe for brown butter waffles. How have I never thought of that?! These are, of course, delicious. 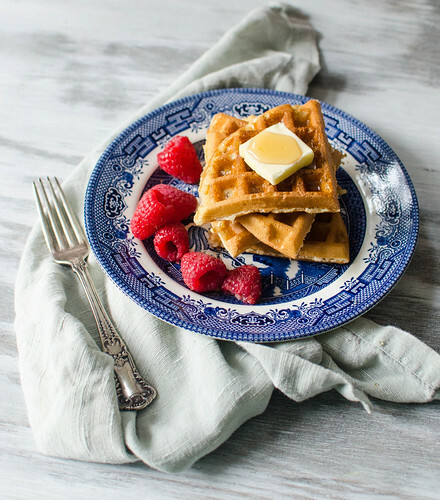 The brown butter just adds a subtle richness to the waffles, leaving you wondering what it is that makes them taste so good - a little bit of a kicked up version of your favorite Sunday morning breakfast. Sure, you have to take a few extra minutes to brown the butter, but it's definitely an extra step that's worth taking. This recipe also calls to separate the eggs, mix the yolks into the batter, and then whip the whites before folding them in. 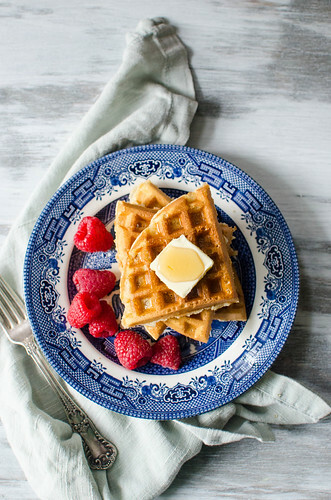 This helps to create light and fluffy waffles that are beautifully crisp on the outside, and soft and tender on the inside. I walked outside this morning, and it just smelled like fall. Granted, it was 85 degrees at 9 am and didn't feel like fall, but I know it's coming. And I can think of no other way I'd rather spend a chilly morning than cuddled up with my sweet babies, drinking coffee, and eating a warm and comforting breakfast. Why not take a few extra minutes to make something special? Preheat an oven to 200°F. Have ready a rimmed baking sheet. In a small saucepan, melt the butter over medium-low heat and bring to a boil. Stirring often, cook until the milk solids in the bottom of the pan turn a toasty brown, about 3 minutes. Immediately transfer to a bowl and let cool slightly. Add the milk, egg yolks and vanilla, and whisk until combined. In a large bowl, sift together the flour, sugar, baking powder and salt. Add the milk mixture and whisk just until combined (leaving a few small lumps are okay). In another bowl, using a clean whisk or a handheld mixer, whip the egg whites until soft peaks form. Scoop the whites onto the batter and, using the whisk, gently fold them in evenly. If your waffle iron is not nonstick, lightly and evenly oil the grid. According to the manufacturer’s instructions, spoon the batter over the grid, close the lid and cook until the waffle is golden brown, usually about 4 minutes. Transfer to the baking sheet and keep warm in the oven. Repeat with the remaining batter. Serve the waffles piping hot with your desired toppings.